It was a hot July morning in 2000 when a helicopter carrying Kazakhstan’s President Nursultan Nazarbayev landed on a drilling barge on the Caspian Sea. An anxious-looking Nazarbayev emerged from the aircraft flanked by his customary coterie of flunkeys and security detail. The occasion would mark what seemed at the time like the finest birthday present he would ever receive. Nazarbayev was to turn 60 two days later, on July 6. Oilmen exploring the northern section of this land-bound sea had made the largest discovery of its type in three decades – a field containing upward of a billion barrels of recoverable crude. 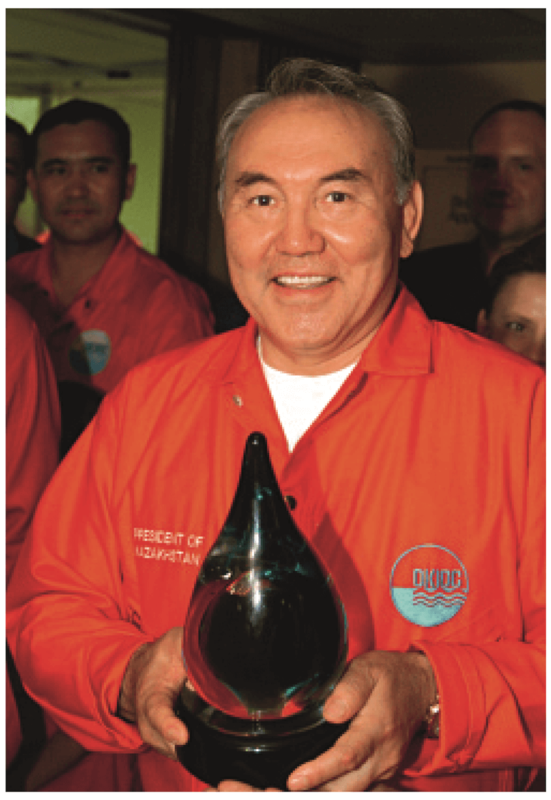 When Nazarbayev was handed a flask of crude oil, he cheerfully anointed the cheeks of subordinates responsible for the project, known as Kashagan, and even a local seven-year-old boy. The scene is described in Black Blood of Kazakhstan, a 2017 book by Oleg Chervinsky, chief editor of Almaty-based Petroleum magazine. As the preface written for Chervinsky’s book by political analyst Dosym Satpayev suggests, crude oil lends itself to symbolic interpretation. "Kazakhstan’s oil, like blood, fed the economic and political system. Meanwhile, its black color is a reminder that there are still many dark spots in the history of Kazakhstan’s oil that will never be washed off,” wrote Satpayev. As a one-time Central Asia correspondent for the Wall Street Journal, Steve Levine, wrote in his book The Oil and the Glory, however, there was more than a little theater in that scene in 2000. Nazarbayev had insisted on visiting Kashagan while the delicate and dangerous work of installing drilling equipment was still ongoing, so some deception was required. “They did the equivalent of borrowing a quart of milk from a neighbor, sending for a five-gallon container of crude from Tengiz [oil field]. They then devised a way for the crude to flow from a valve on the oil rig,” Levine wrote in his 2007 book. Kashagan and the sulfurous oil lying within it has always been a tricky business. What is pumped from Kashagan, from depths of around 4,500 meters, is just one component of a Kazakhstan-specific product known as CPC Blend. The name derives from the pipeline built in 2001 by a multinational consortium called the Caspian Pipeline Consortium. Russia’s Transneft holds a 31 percent stake in CPC, Kazakhstan’s government controls another 19 percent, while the rest is shared between companies based in the United States, Russia, Italy, the United Kingdom and elsewhere. The 1,500-kilometer pipe disgorges its product at a Black Sea terminal in the city of Novorossiysk in southern Russian. Long before it was carrying Kashagan crude, the 1,500-kilometer CPC route was pumping oil extracted from places like Tengiz – the second-largest oilfield in Kazakhstan, in the northwestern Atyrau region – and crude from Karachaganak, another 460 kilometers north as the crow flies. Oil from the Filanovsky field, operated by Russia’s LUKoil, is also thrown into the mix. Around two-thirds of CPC Blend is shipped to European buyers in Italy, the Netherlands, France, Switzerland and Spain, Energyprom monitoring agency has reported, citing National Economy Ministry data. CPC Blend is a light grade of crude with one particularly nasty feature – the substantial presence of foul-smelling and corrosive gases called mercaptans. Kashagan was catastrophically late in coming online because of these noxious substances. In 2013, long after the project ought to have been pumping out large consignments of crude, engineers were exasperated to discover that pipes from Kashagan had sprung leaks caused by the dangerously corrosive gas. As Tanat Kozhmanov, author of a book about Kazakhstan’s oil and gas industry, explained to Eurasianet, refining and processing CPC Blend requires the use of specialized techniques and equipment with anti-corrosion coating. “For this reason, the CPC Blend sales market is limited. As a rule, these are countries whose refineries are adapted to raw materials with such characteristics,” Kozhmanov said. Despite this shortcoming, CPC Blend sells at a slight premium over Russia’s Urals export product but cheaper than international benchmark Brent crude. Maurizio Totaro, a researcher at Ghent University in Belgium, said that CPC Blend was sold at a good discount to Brent last year. To make matters worse, the booming U.S. shale oil industry helped make CPC Blend even less salable. That recent modernization work on the CPC pipeline alluded to by Totaro was completed at a cost of around $5.8 billion and has seen a growth in capacity to 1.45 billion barrels daily. Kazakhstan has little choice but to embrace the dumping model, however, as well as search out new markets. According to shipping data collated by Reuters, in the first half of 2018, CPC Blend shipments outside Europe exceeded 6 million tons, or two times more than in the same period of 2017. Last year, South Korean purchases of CPC Blend significantly increased. According to Kazakhstan’s National Economy Ministry, in the period from January to September in 2018, exports to that country amounted to more than $2 billion against half a billion during the same period in 2017. Oil accounted for that surge. In September, CPC Blend shipments to South Korea, Japan, China and India amounted to 14 million barrels, up from the usual monthly shipments of 10-11 million barrels normally seen for countries outside of Europe, energy analyst outfit S&P Global Platts reported. And Totaro suggested that with the introduction of U.S. anti-Iranian sanctions in November, Kazakhstan’s oil, which is similar in quality to the raw product emerging from the Persian Gulf, could prove a suitable substitute. Kazakhstan produces other strains of oil. As Chervinsky told Eurasianet, what is pumped out of the Kumkol field in central Karaganda region is high-quality oil with characteristics similar to Brent – light and low in sulfur. While some of that goes toward Kazakhstan’s domestic needs and is processed at the Shymkent refinery, the rest is exported to China through an overland pipeline. A heavy, dark and low-quality variety is also pumped in the western Mangystau region. It is loaded into the Atyrau-Samara pipeline, where it mixes with higher-quality Russian varieties, and then goes through Russia to Europe. Kozhmanov said that while Kazakhstan can consider itself lucky to have its oil riches, this legacy is not always an unqualified blessing. 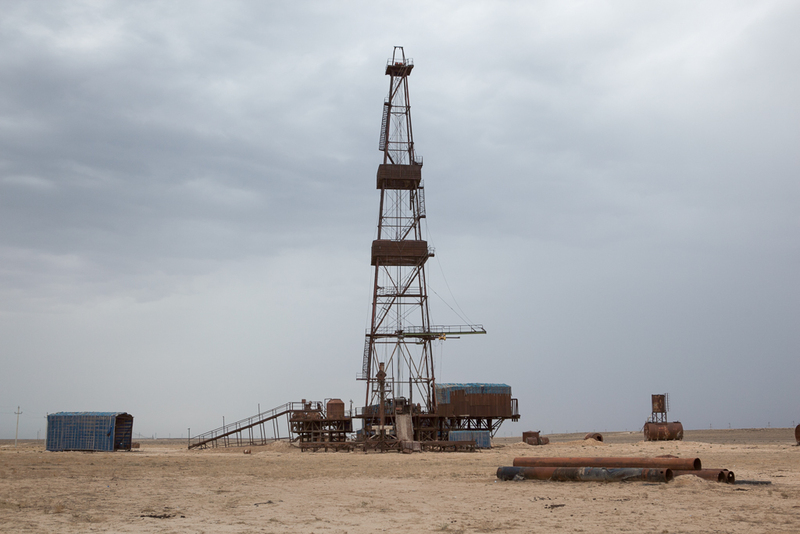 “A quarter of a century has passed since we gained control over large oil fields, and still Kazakhstan’s wellbeing depends on prices for the black gold. What we call our boon might play tricks on us in future,” he said.